Miami boasts a huge number of attractions that visitors can enjoy and those that want to see some wildlife and green landscapes can do so at Jungle Island. This zoological park is home to a variety of exotic animals and offers the chance for anyone to get up close with them. The history of Jungle Island dates back to 1936, when Franz Scherr opened the park as Parrot Island. This first offered visitors the chance to view these beautiful birds and moved on to performing parrot shows a few years later. As the popularity of the park grew it added more animals to its collection and this included flamingoes, orangutangs and tigers. In 1995 the decision was taken to move away from its original Red Road location and in 2003 the park opened at Watson Island as Parrot Jungle Island. The name was changed to Jungle Island in 2007 and the zoo has remained a popular attraction in Miami to the present day. Rather than just watching the animals from a distance, the park allows close encounters with them and this is one of the best reasons to visit. As a parent you can let your kids enjoy the Jungle Island as they interact with different animals. The look on their face will be priceless as they enjoy petting lemurs, parrots, monkeys, small reptiles and a host of other animals. Anyone planning to visit the zoo has a choice of a few different experiences. The VIP Safari Tour is a 90 minute adventure around the grounds that offers the chance to interact with many of the animals. Those taking this can make special requests about which animals they most want to spend time with. The Lemur Experience provides the chance to meet and learn about the zoo’s lemur population. This includes an opportunity to hold one of these charming animals. The Jungle Encounter allows groups of 10 to 50 to take a tour of the park to view the animals and Critter Tales is a visit to the Serpentarium to encounter snakes, lizards and other reptiles. The zoo offers some great shows to watch. This includes Winged Wonders in the Parrot Bowl, which showcases some of the park’s birds. Wild Encounter provides the chance to see some of the big cats. 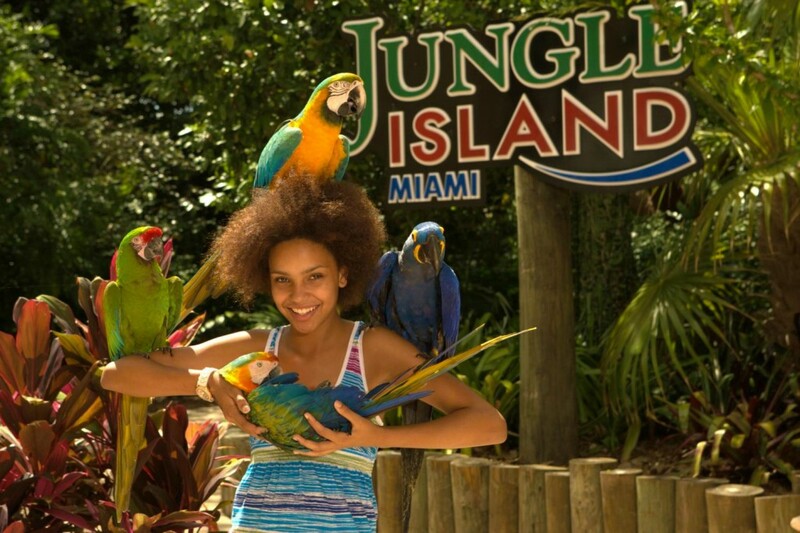 A trip to Jungle Island ensures a great day out in Miami and is definitely an attraction to visit in the city. We are headed to Miami this year and my husband and I are looking for fun things to do, this is absolutely on our list. Have you been to Miami and Jungle Island before? I've never been to Miami, except on a layover, but this looks like SO much fun! My parents took me on a ton of neat vacations and I can't wait to do the same for my little ones! This looks like such a fun place! I love how interactive everything is! THanks for sharing! This sounds like a wonderful time. I would really enjoy visiting! I'll have to keep this bookmarked for a future trip to Miami. I've always wondered what there is to do with kids there besides the beach. Haha, me too! It definitely has a lot of \”grown up\” things to do but, there\’s zoos and museums too. Never been to Miami or Jungle Island but it looks like a blast. Thanks for sharing. My recent post Collision Course by Chuck Gleason – Book Review &amp; Tour! We used to have one long ago too. 🙂 That is aweome, have fun when you do go. Oh those jungle island shows would be a lot of fun to see. My kids and I love going to shows like that at amusement parks in our area. a bit educational but full of entertainment. I love Parrot Jungle island! You will have a great time when you go! This looks like a very fun way to spend an afternoon! This sounds like a ton of fun! I would love those interactive exhibits. I'm sure the rest of my family would, too. How cool! My parents have really cute pictures from Parrot Island from before I was born and I always wanted to visit. Will have to re-add to the wish lsit! WOW, that would be so cool to see. I love seeing places \”BEFORE\”, there is so much history everywhere. I think my favorite part would be the Lemur Experience.That sounds so cool! We have been here several times! It's a favorite every time we go to Miami we pass it and the kids love it! They have some great exhibits, and the shows are fantastic! I would absolutely love to see the big cats!!! My pleasure, hope you enjoy! How is that bird being held like a baby??? LOL I didn't know that could happen! Sounds like a really fun place to go. Really want to plan a trip to Florida soon. Me neither! Hahaha! I love Florida, I cannot stay away. How fun! Miami is one of the most fun places in all of Florida, and their zoos are AMAZING! Glad you had fun! I’d love to visit Miami. It seems like such a diverse city with so much to do. We've only been to Miami once and it was for a work trip for my husband. I came at the end of his conference and we made a long weekend out of it but didn't get to do too much. This would have been fun! I've never been but it looks and sounds like a good time. I'd love to be in Florida instead of Michigan this time ofyear , its so cold and yucky here. I am with you neighbor, I am waving to you from across the river! I have never been. My brother lives in that area, i'll have to share with him. This looks like so much fun! I would love to take my family here! We live not too far from there, this place is so much fun, lots to do and see! Sounds like there is so much to do there! I have thought about a family road trip to that area. I love that is really is family friendly! I never got a lot of time to explore Miami when I lived in Florida. This definitely seems like a great day trip. We may need to check it out the next time we fly in to visit family. Definitely, there is so much to do! Looks like a great place to visit next time I make it to FL! Thanks! I've been to Miami twice but never heard of this – or maybe I was never looking! It looks like a great place to spend a half day. Love birds! I have been to Miami but not Jungle Island. My kids would love to visit this fun place! Wow,it sure looks like a wonderful place to visit !